We Drink Your Milkshake! 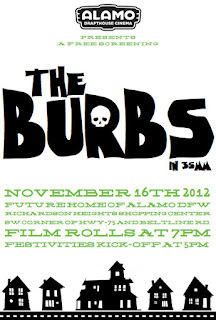 : First Public Alamo Drafthouse Richardson Event! First Public Alamo Drafthouse Richardson Event! It's starting! We're about five months away from the opening of the new Alamo Drafthouse in Richardson, and they're not wasting anytime getting the word out and interest up. 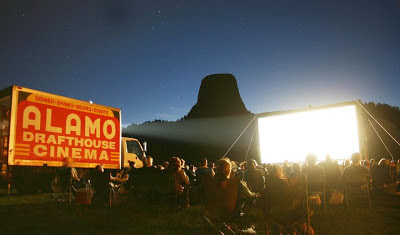 One part of the Drafthouse family is there Rolling Road Shows, where they bring movies to famous parts of Texas, and you bring your chairs and blankets and enjoy the show. The festivities start at 5pm with the film rolling at 7pm. Sounds like an event not to be missed! You can follow the DFW Alamo Drafthouse facebook page here. And we will keep you updated as event details come in! 11/6: Local dive bar in Dallas, Lee Harvey's, will provide the outdoor bar with select local beer and wine. Also, this event is BYOC...Bring Your Own Chair!